Franklin Electric SubDrive constant pressure systems are used in homes all over the country. Whether you have city water or a private well, Franklin constant pressure systems are available in a variety of models so you are sure to find one suited for your needs. SubDrive family constant pressure products can be installed in new water well systems, as well as existing well and municipal systems. So, if you're building a new home, replacing an old system or just looking to update your current system Franklin constant pressure will work for you. In addition, Franklin SubDrive constant pressure systems feature smooth, quiet operation, a wide variety of pressure settings and built-in pump protection. In Franklin Electric SubDrive systems, a pressure sensor continually adjusts the speed of the pump, matching water demand. Instead of draining and filling a tank, this system provides continuous pressure regardless of water usage. Click here to learn more. Franklin's Inline 1100 Constant Pressure System installs into your existing water system and monitors the water usage of your home, providing increased and consistent water pressure without fluctuation. Click here to learn more. Franklin's Inline 400 is a compact and economical way to meet all of your pressure boosting needs. 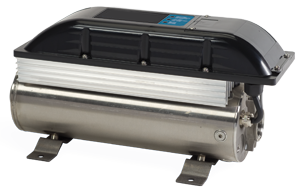 It couples a proven Franklin Electric pump and motor with simple flow-based controls to provide a typical water pressure boost of up to 40 PSI, depending on the application's need. The unit's symmetrical design allows for easy installation mounting either vertically or horizontally to fit within most existing plumbing configurations - including those where space is limited. Click here to learn more.